A pop-up promotion in Central Park featured some of New York City’s leading pupfluencers, among them Toast, a rescued spaniel with 377,000 Instagram followers. 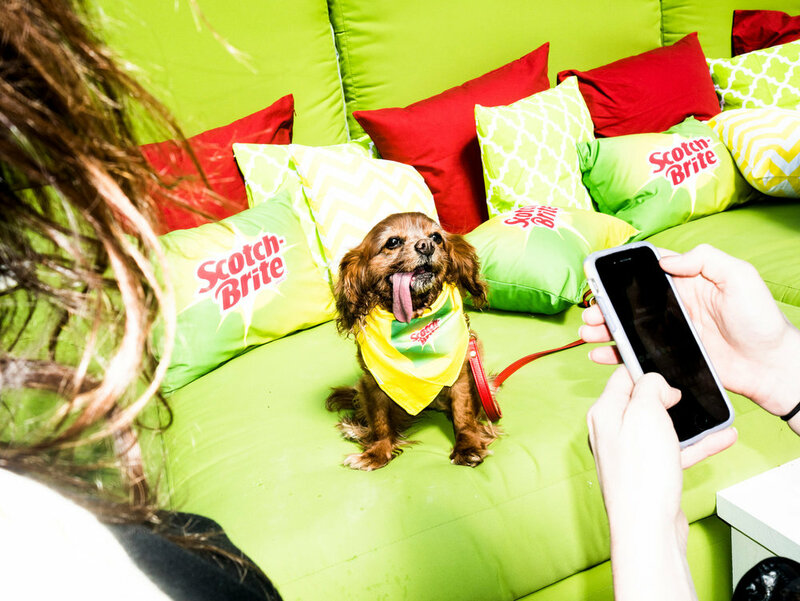 The couch set up in Central Park was oversize and lime green and crowded with Instagram celebrity dogs and cushions bearing the logo of Scotch-Brite lint rollers. It was a warm, sunny Wednesday in May. The dogs wore lime green and yellow Scotch-Brite bandannas and their owners wore expressions of strenuous amusement. The event, Scotch-Brite said, featured some of New York City’s leading “pupfluencers”: Toast (@toastmeetsworld), a rescued spaniel with 377,000 Instagram followers, famous for her hanging tongue; Louboutina (@louboutinanyc), the “hugging dog” with 165,000 followers, and more. “They are very important for me, particularly when it comes to clothing,” said the owner of the up-and-coming Griffon, Sprout (@brussels.sprout, 63,000 followers). To some, this scene may have seemed odd. In fact, given the rise of influencer marketing, in which people with big social-media followings are paid to promote products, and the hugeness of animal photos on Instagram, it was closer perhaps to inevitable. There is now a talent agency based in New York that represents social-media celebrity animals. It is called the Dog Agency, though its 80-creature stable also includes a hedgehog, a pig and a pair of finger monkeys with over a million followers. “Pet influencers outperform humans,” said Loni Edwards, 32, the agency’s founder. Which is to say their posts go viral more often, and they get more comments and more likes. All the dogs at the Scotch-Brite pop-up were Dog Agency clients. Their contracts required them to post. Sprout wrote: “Had so much fun yesterday! Rollin’ around on the cuddle couch with @scotchbrite_3m Lint Rollers showed NYC (and mom!) just why us pets are so #WorthTheMess! #sponsored.” The post got 2,154 likes. Ms. Edwards said that pets whose followers number in the hundreds of thousands could get $3,000 to $10,000 for each piece of content. They prize authenticity. “It’s quite important to us to remain authentic so we only work with brands we use,” said Stephanie Zheng, owner of Atticus (@atticusthehedgie, 77,000 followers), a hedgehog who postedabout his love for Burger King Cheesy Tots. They are passionate about charitable causes and awareness-raising campaigns, and careful not to gum up their feeds with too many ads. And no matter how successful they get, they are only in this crazy business to make people happy. Glee (@goldens_glee), a 6-month-old retriever puppy with 300,000 followers, may be the ultimate example of this. She was a brand of happiness before she was even a dog. Given the rise of influencer marketing and dog celebrities on Instagram, forays into product placement were perhaps inevitable. Not all pupfluencers are represented by the Dog Agency. Winston (@winstonthewhitecorgi, 198,000 followers) has no agent. He has teamed up with American Express and Polaroid. His owner, Tina Kim, a city employee, says she turned down offers from both Coke and Pepsi.